A grass-roots effort is designed to help recruit more black advisors to Raymond James, and provide support and mentoring to existing advisors. 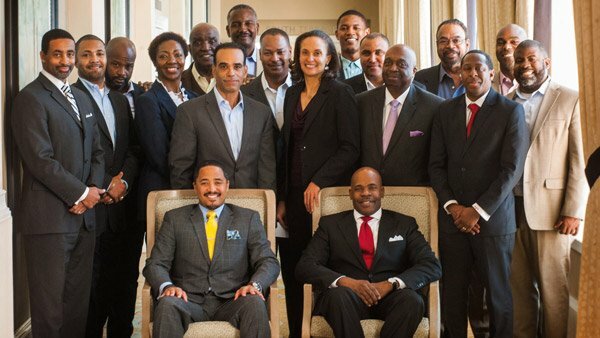 Attendees pose at the first meeting of Raymond James' Black Financial Advisors Network. Seated are two of the three co-founders: Joel Burstein (left) and Kaon Nelson. During the annual conference of its independent contractor advisors in Las Vegas last week, Raymond James announced the formation of the Black Financial Advisors Network. Founded by three advisors within the Raymond James network — Tony Barrett, Joel Burstein and Kaon Nelson — the BFAN has the support of Raymond James’ top leadership, including CEO Paul Reilly, with the goals of recruiting more black advisors to Raymond James and of increasing existing black advisors’ success at the company. In an interview during the conference, Barrett said that one of BFAN’s goals is to make black advisors “feel welcome at Raymond James,” but since the industry itself “doesn’t have a lot of diverse talent, we need to make the industry more attractive to young people.” Why start this group now? In the same interview, Burstein said “it’s the right time to do something more inclusive for the firm,” since there are more affluent black Americans, “plus the talent pool has increased” for new advisors among black college graduates. When it comes to education and training, “the industry has a one-size-fits-all approach to everything,” Barrett says, “but we know that the results have not been equal for all groups” when it comes to training success. Barrett, Burstein — RJA’s Miami branch manager — and Nelson, who had joined Raymond James with the Morgan Keegan acquisition, had informally discussed how to achieve those aims, but Barrett said it was Tash Elwyn, president of RJA, “who called our bluff,” and the three men realized that “if we were going to do something it would have to come from us.” So in February the first formal meeting of the Black Financial Advisors Network took place in St. Petersburg Beach, Florida, with about 30 people attending from across Raymond James. Barrett points out that “this business is tough, especially getting started; so don’t think that having a mentor is going to make things easier,” and Burstein adds that “everybody in this business hears ‘No” thousands of times. But having both an informal and formal mentoring program and looking at improved training and education that will increase advisors’ chances of success will benefit the advisors and Raymond James. — Check out Turning Succession Planning Into Business Growth: Raymond James on ThinkAdvisor.